In 1933, Ghormley coined the term facet syndrome to describe a constellation of symptoms associated with degenerative changes of the lumbar spine. Relatively recently, the term cervical facet syndrome has appeared in the literature and implies axial pain presumably secondary to involvement of the posterior elements of the cervical spine. Many pain generators are located in the cervical spine, including the intervertebral discs, facet joints, ligaments, muscles, and nerve roots. The facet joints have been found to be a possible source of neck pain, and the diagnosis of cervical facet syndrome is often one of exclusion or not considered at all. For excellent patient education resources, visit eMedicineHealth's First Aid and Injuries Center and Osteoporosis Center. Also, see eMedicineHealth's patient education articles Whiplash, Shoulder and Neck Pain, and Neck Strain, and Chronic Pain. Aprill and Bogduk estimated the prevalence of cervical facet joint pain by reviewing the records of patients who had presented with neck pain for at least 6 months secondary to some type of injury. These patients underwent discography, facet joint nerve blocks, or both at the request of the referring physicians. A large study by Manchikanti et al involved 500 patients with chronic, nonspecific spine pain. The prevalence of facet joint pain was determined using controlled comparative local anesthetic blocks with 1% lidocaine followed by 0.25% bupivacaine. This study indicated that the prevalence of cervical facet joint pain was 55%. The results demonstrated that 41% of this group had a painful disc and facet joint at the same segment, and an additional 23% had a painful facet joint but not a painful disc at the same segment. Therefore, most of the sample had a painful facet joint, but there was often a painful disc at the same level. This finding is not surprising when one considers how the facet joints and discs are intimately involved in motion of the cervical spine. Cervical facet joint pain is a common sequela of whiplash injury. Barnsley and Lord et al studied the prevalence of chronic cervical facet joint pain after whiplash injury using double-blind, controlled, diagnostic blocks of the facet joints. The joints were blocked randomly with either a short-acting or long-acting anesthetic, and, if complete pain relief was obtained, the joint was blocked with the other agent 2 weeks later. Of the 38 patients who completed the trial, 27 obtained complete relief from both anesthetics and longer relief from the longer acting agent. Therefore, the prevalence of this sample is 54%, making cervical facet joint pain the most common cause of chronic neck pain after whiplash injury in this population. Lord and Barnsley et al subsequently studied the prevalence of chronic cervical facet joint pain after whiplash injury using a double-blind, placebo-controlled protocol. The sample consisted of 68 consecutive patients referred for neck pain secondary to a motor vehicle accident and longer than 3 months in duration. Those individuals with a predominant headache underwent a third occipital nerve block and were removed from the study if they received pain relief. The third occipital nerve has a cutaneous branch and a branch to the C2-C3 facet joint; therefore, patients with pain from this segment could not participate in the placebo study because they would feel the effects of the local anesthetic. The remaining 41 patients underwent diagnostic blocks with either a short-acting or a long-acting local anesthetic, followed by a second block with either normal saline or the other anesthetic, followed by a third block with the remaining agent. The investigators reported the positive responders experienced complete relief with each anesthetic and no relief with the normal saline. The prevalence of cervical facet joint pain after whiplash injury was found to be 60%, and the most common levels were C2-C3 and C5-C6. The cervical spine is made up of the first 7 vertebrae and functions to provide mobility and stability to the head, while connecting it to the relative immobile thoracic spine (see the image below). The first 2 vertebral bodies are quite different from the rest of the cervical spine. The atlas, or C1, articulates superiorly with the occiput and inferiorly with the axis, or C2. 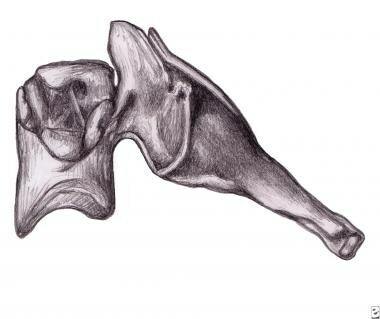 The atlas is ring-shaped and does not have a body, unlike the rest of the vertebrae. The body has become part of C2, and it is called the odontoid process, or dens. The atlas is made up of an anterior arch, a posterior arch, 2 lateral masses, and 2 transverse processes. The transverse foramen, through which the vertebral artery passes, is enclosed by the transverse process. 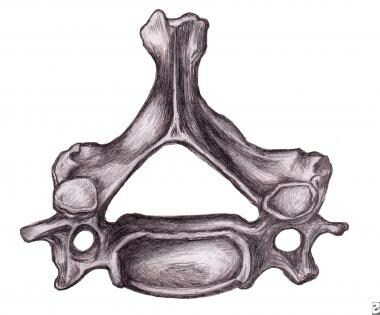 On each lateral mass is a superior and inferior facet (zygapophyseal) joint. The superior articular facets are kidney-shaped, concave, and face upward and inward. These superior facets articulate with the occipital condyles, which face downward and outward. The relatively flat inferior articular facets face downward and inward to articulate with the superior facets of the axis. The axis has a large vertebral body, which contains the fused remnant of the C1 body, the dens. The dens articulates with the anterior arch of the atlas via its anterior articular facet and is held in place by the transverse ligament. The axis is composed of a vertebral body, heavy pedicles, laminae, and transverse processes, which serve as attachment points for muscles. The axis articulates with the atlas by its superior articular facets, which are convex and face upward and outward. The remaining cervical vertebrae, C3-C7, are similar to each other, but they are very different from C1 and C2. They each have a vertebral body, which is concave on its superior surface and convex on its inferior surface. On the superior surfaces of the bodies are raised processes or hooks called uncinate processes, which articulate with depressed areas on the inferior aspect of the superior vertebral bodies called the echancrure or anvil. These uncovertebral joints are most noticeable near the pedicles and are usually referred to as the joints of Luschka. These joints are believed to be the result of degenerative changes in the annulus, which leads to fissuring in the annulus and the creation of the joint. The spinous processes of C3-C5 are usually bifid, in comparison to the spinous processes of C6 and C7, which are usually tapered. The fibrous capsules are innervated by mechanoreceptors (types I, II, and III), and free nerve endings have been found in the subsynovial loose areolar and dense capsular tissues. In fact, there are more mechanoreceptors in the cervical spine than in the lumbar spine. This neural input from the facets may be important for proprioception and pain sensation and may modulate protective muscular reflexes that are important in preventing joint instability and degeneration. The facet joints in the cervical spine are innervated by both the anterior and dorsal rami. The occipitoatlantal (OA) joint and atlantoaxial (AA) joint are innervated by the ventral rami of the first and second cervical spinal nerves. Two branches of the dorsal ramus of the third cervical spinal nerve innervate the C2-C3 facet joint, a communicating branch and a medial branch known as the third occipital nerve. The remaining cervical facets, C3-C4 to C7-T1, are supplied by the dorsal rami medial branches that arise one level cephalad and caudad to the joint. [18, 19] Therefore, each joint from C3-C4 to C7-T1 is innervated by the medial branches above and below. These medial branches send off articular branches to the facet joints as they wrap around the waists of the articular pillars. The alar ligaments run from the lateral aspects of the dens to the ipsilateral medial occipital condyles and to the ipsilateral atlas. The alar ligaments limit axial rotation and side bending. If the alar ligaments are damaged, as in a whiplash injury, the joint complex becomes hypermobile, which can lead to kinking of the vertebral arteries and stimulation of the nociceptors and mechanoreceptors. This may be associated with the typical complaints of patients with whiplash injuries such as headache, neck pain, and dizziness. The alar ligaments prevent excessive lateral and rotational motions, while allowing flexion and extension. The supraspinous ligament, interspinous ligament, and ligamentum flavum maintain stability between the vertebral arches. The supraspinous ligament runs along the tips of the spinous processes, the interspinous ligament runs between the spinous processes, and the ligamentum flavum runs from the anterior surface of the cephalad vertebra to the posterior surface of the caudad vertebra. The interspinous ligament and especially the ligamentum flavum control for excessive flexion and anterior translation. [26, 27, 28] The ligamentum flavum also connects to and reinforces the facet joint capsules on the ventral aspect. The ligamentum nuchae is the cephalad continuation of the supraspinous ligament and has a prominent role in stabilizing the cervical spine. The orientation of the facet joints alone does not determine the pattern of motion. In the lumbar spine, the pattern of motion does not change after the facets are removed, which implies that the discs and ligaments determine the pattern of motion. Also, because of the orientation of the annular fibers in the disc, there is very little rotation in the lumbar spine. However, it is known that there is a great deal of rotation in the cervical spine. Therefore, the discs do not seem to be the primary determinant of motion in the cervical spine. With axial rotation of the atlas on the axis, there is a coupled movement of vertical translation of the atlas, so that it is at its lowest position at the extremes of right and left rotation and at its highest position at neutral. This coupling of translation with rotation is secondary to the orientation of the facets. The instantaneous axis of rotation (IAR) is a term used to describe the motion of one vertebral body in relation to the vertebral body below. The IAR has been estimated at the OA joint,  the AA joint,  and in the cervical spine from C2-C3 to C6-C7. In the middle and lower cervical spine, the IAR has been measured for each segment from C2-C3 to C6-C7 in asymptomatic people. In a subsequent study, the IARs were measured in persons with neck pain, who had not received a diagnosis after examination and imaging of the cervical spine. Abnormal IARs were found in 46% of the patients, and an additional 26% had marginal findings. However, the location of the abnormal motion segments did not correlate with the findings on discography or facet joint blocks. Makela M, Heliovaara M, Sievers K, et al. Prevalence, determinants, and consequences of chronic neck pain in Finland. Am J Epidemiol. 1991 Dec 1. 134(11):1356-67. [Medline]. Bovim G, Schrader H, Sand T. Neck pain in the general population. Spine. 1994 Jun 15. 19(12):1307-9. [Medline]. Ghormley R. Low back pain with special reference to the articular facets with presentation of an operative procedure. JAMA. 1933. 101:1773-7. Fukui S, Ohseto K, Shiotani M, et al. Referred pain distribution of the cervical zygapophyseal joints and cervical dorsal rami. Pain. 1996 Nov. 68(1):79-83. [Medline]. Friedenberg ZB, Miller WT. Degenerative disease of the cervical spine. J Bone Joint Surg Am. 1963 Sep. 45:1171-8. [Medline]. [Full Text]. Aprill C, Bogduk N. The prevalence of cervical zygapophyseal joint pain. A first approximation. Spine. 1992 Jul. 17(7):744-7. [Medline]. Manchikanti L, Boswell MV, Singh V, Pampati V, Damron KS, Beyer CD. Prevalence of facet joint pain in chronic spinal pain of cervical, thoracic, and lumbar regions. BMC Musculoskelet Disord. 2004 May 28. 5:15. [Medline]. [Full Text]. Bogduk N, Aprill C. On the nature of neck pain, discography and cervical zygapophysial joint blocks. Pain. 1993 Aug. 54(2):213-7. [Medline]. Barnsley L, Lord SM, Wallis BJ, Bogduk N. The prevalence of chronic cervical zygapophysial joint pain after whiplash. Spine. 1995 Jan 1. 20(1):20-5; discussion 26. [Medline]. Lord SM, Barnsley L, Wallis BJ, McDonald GJ, Bogduk N. Percutaneous radio-frequency neurotomy for chronic cervical zygapophyseal-joint pain. N Engl J Med. 1996 Dec 5. 335(23):1721-6. [Medline]. [Full Text]. Ashina S, Bendtsen L, Lyngberg AC, Lipton RB, Hajiyeva N, Jensen R. Prevalence of neck pain in migraine and tension-type headache: A population study. Cephalalgia. 2014 May 22. [Medline]. Hoy D, March L, Woolf A, Blyth F, Brooks P, Smith E, et al. The global burden of neck pain: estimates from the global burden of disease 2010 study. Ann Rheum Dis. 2014 Jul. 73(7):1309-15. [Medline]. Johnson R. Anatomy of the cervical spine and its related structures. Torg JS, ed. Athletic Injuries to the Head, Neck, and Face. 2nd ed. St Louis, Mo: Mosby-Year Book; 1991. 371-83. Parke WW, Sherk HH. Normal adult anatomy. Sherk HH, Dunn EJ, Eismon FJ, et al, eds. The Cervical Spine. 2nd ed. Philadelphia, Pa: JB Lippincott Co; 1989. 11-32. Bland J. Disorders of the Cervical Spine. Philadelphia, Pa: WB Saunders Co; 1987. McLain RF. Mechanoreceptor endings in human cervical facet joints. Spine. 1994 Mar 1. 19(5):495-501. [Medline]. Bogduk N, Twomey L. Clinical Anatomy of the Lumbar Spine. 2nd ed. New York, NY: Churchill Livingstone; 1991. Dreyfus P. The cervical spine: Non-surgical care Presented at: The Tom Landry Sports Medicine and Research Center; April 8, 1993; Dallas, Texas. Bogduk N. The clinical anatomy of the cervical dorsal rami. Spine. 1982 Jul-Aug. 7(4):319-30. [Medline]. Panjabi MM, Oxland TR, Parks EH. Quantitative anatomy of cervical spine ligaments. Part I. Upper cervical spine. J Spinal Disord. 1991 Sep. 4(3):270-6. [Medline]. Panjabi MM, Oxland TR, Parks EH. Quantitative anatomy of cervical spine ligaments. Part II. Middle and lower cervical spine. J Spinal Disord. 1991 Sep. 4(3):277-85. [Medline]. Fielding JW, Cochran GB, Lawsing JF 3rd, Hohl M. Tears of the transverse ligament of the atlas. A clinical and biomechanical study. J Bone Joint Surg Am. 1974 Dec. 56(8):1683-91. [Medline]. [Full Text]. Panjabi MM, Vasavada A, White A III. Cervical spine biomechanics. Semin Spine Surg. 1993. 5:10-6. White AA III, Panjabi MM. The problem of clinical instability in the human spine: a systematic approach. White AA III, Panjabi MM, eds. Clinical Biomechanics of the Spine. 2nd ed. Philadelphia, Pa: JB Lippincott Co; 1990. 277-378. White AA III, Panjabi MM. Kinematics of the spine. White AA III, Panjabi MM, eds. Clinical Biomechanics of the Spine. 2nd ed. Philadelphia, Pa: JB Lippincott Co; 1990. 92-102. Lysell E. Motion in the cervical spine. An experimental study on autopsy specimens. Acta Orthop Scand. 1969. Suppl 123:1+. [Medline]. Penning L. Functional anatomy of joints and discs. Sherk HH, Dunn EJ, Eismon FJ, et al, eds. The Cervical Spine. 2nd ed. Philadelphia, Pa: JB Lippincott Co; 1989. 33-56. White A, Panjabi M. Spinal kinematics in the research status of spinal manipulative therapy. 1975. Rolander SD. Motion of the lumbar spine with special reference to the stabilizing effect of posterior fusion. An experimental study on autopsy specimens. Acta Orthop Scand. 1966. Suppl 90:1-144. [Medline]. Horton WG. Further observations on the elastic mechanism of the intervertebral disc. J Bone Joint Surg Br. 1958 Aug. 40-B(3):552-7. [Medline]. [Full Text]. Hall MC. Luschka's Joint. Springfield, Ill: Charles C Thomas; 1965. Vol 1: 141. Tondury G. Entwicklungsgeschichte und Fehlbildungen der Wirbelsaule. Stuttgart, Germany: Hippokrates Verlag; 1958. 87-100. WERNE S. Studies in spontaneous atlas dislocation. Acta Orthop Scand Suppl. 1957. 23:1-150. [Medline]. Clark C, Goel V, Galles K, et al. Kinematics of the occipito-atlanto-axial complex. Trans Cerv Spine Res Soc. 1986. Henke W. Handbuch der Anatomie und Mechanik der Gelenke mit Rucksicht. Leipszig and Heidelberg, Germany: CF Winter; 1863. Selecki BR. The effects of rotation of the atlas on the axis: experimental work. Med J Aust. 1969 May 17. 1(20):1012-5. [Medline]. Miller RG, Burton R. Stroke following chiropractic manipulation of the spine. JAMA. 1974 Jul 8. 229(2):189-90. [Medline]. Amevo B, Aprill C, Bogduk N. Abnormal instantaneous axes of rotation in patients with neck pain. Spine. 1992 Jul. 17(7):748-56. [Medline]. Amevo B, Worth D, Bogduk N. Instantaneous axes of rotation of the typical cervical motion segments. A study in normal volunteers. Clin Biomech. 1991. 6:111-17. Bogduk N, Marsland A. The cervical zygapophysial joints as a source of neck pain. Spine. 1988 Jun. 13(6):610-7. [Medline]. Dwyer A, Aprill C, Bogduk N. Cervical zygapophyseal joint pain patterns. I: A study in normal volunteers. Spine. 1990 Jun. 15(6):453-7. [Medline]. Aprill C, Dwyer A, Bogduk N. Cervical zygapophyseal joint pain patterns. II: A clinical evaluation. Spine. 1990 Jun. 15(6):458-61. [Medline]. Dreyfuss P, Michaelsen M, Fletcher D. Atlanto-occipital and lateral atlanto-axial joint pain patterns. Spine. 1994 May 15. 19(10):1125-31. [Medline]. Star MJ, Curd JG, Thorne RP. Atlantoaxial lateral mass osteoarthritis. A frequently overlooked cause of severe occipitocervical pain. Spine. 1992 Jun. 17(6 suppl):S71-6. [Medline]. Windsor RE, Nagula D, Storm S, Overton A, Jahnke S. Electrical stimulation induced cervical medial branch referral patterns. Pain Physician. 2003 Oct. 6(4):411-8. [Medline]. [Full Text]. Cole A, Farrell J, Stratton SChandler J. Functional rehabilitation of cervical spine athletic injuries. Kiebler W., Herring S, Press J, Lee P, eds. Functional Rehabilitation of Sports and Musculoskeletal Injuries. Gaithersburg, Md: Aspen Publishers; 1998. 127-48. Wiberg J. [Cervical disk defects. Results of surgical treatment of cervical vertebral radiculopathy] [Norwegian]. Tidsskr Nor Laegeforen. 1992 Mar 10. 112(7):876-80. [Medline]. Williams JL, Allen MB Jr, Harkess JW. Late results of cervical discectomy and interbody fusion: some factors influencing the results. J Bone Joint Surg Am. 1968 Mar. 50(2):277-86. [Medline]. [Full Text]. Moran R, O'Connell D, Walsh MG. The diagnostic value of facet joint injections. Spine. 1988 Dec. 13(12):1407-10. [Medline]. Lewin T. Osteoarthritis in lumbar synovial joints. A morphological study. Acta Orthop Scand Suppl. 1964. Suppl 73:1-112. [Medline]. Barnsley L, Lord SM, Wallis BJ, Bogduk N. Lack of effect of intraarticular corticosteroids for chronic pain in the cervical zygapophyseal joints. N Engl J Med. 1994 Apr 14. 330(15):1047-50. [Medline]. Dory MA. Arthrography of the cervical facet joints. Radiology. 1983 Aug. 148(2):379-82. [Medline]. [Full Text]. Fairbank JC, Park WM, McCall IW, O'Brien JP. Apophyseal injection of local anesthetic as a diagnostic aid in primary low-back pain syndromes. Spine. 1981 Nov-Dec. 6(6):598-605. [Medline]. Roy DF, Fleury J, Fontaine SB, Dussault RG. Clinical evaluation of cervical facet joint infiltration. Can Assoc Radiol J. 1988 Jun. 39(2):118-20. [Medline]. Barnsley L, Bogduk N. Medial branch blocks are specific for the diagnosis of cervical zygapophyseal joint pain. Reg Anesth. 1993 Nov-Dec. 18(6):343-50. [Medline]. Lord SM, Barnsley L, Bogduk N. The utility of comparative local anesthetic blocks versus placebo-controlled blocks for the diagnosis of cervical zygapophysial joint pain. Clin J Pain. 1995 Sep. 11(3):208-13. [Medline]. Barnsley L, Lord S, Bogduk N. Comparative local anaesthetic blocks in the diagnosis of cervical zygapophysial joint pain. Pain. 1993 Oct. 55(1):99-106. [Medline]. Zervas NT, Kuwayama A. Pathological characteristics of experimental thermal lesions. Comparison of induction heating and radiofrequency electrocoagulation. J Neurosurg. 1972 Oct. 37(4):418-22. [Medline]. McDonald GJ, Lord SM, Bogduk N. Long-term follow-up of patients treated with cervical radiofrequency neurotomy for chronic neck pain. Neurosurgery. 1999 Jul. 45(1):61-7; discussion 67-8. [Medline]. Sherman KJ, Cherkin DC, Hawkes RJ, Miglioretti DL, Deyo RA. Randomized trial of therapeutic massage for chronic neck pain. Clin J Pain. 2009 Mar-Apr. 25(3):233-8. [Medline]. Bronfort G, Evans R, Anderson AV, Svendsen KH, Bracha Y, Grimm RH. Spinal manipulation, medication, or home exercise with advice for acute and subacute neck pain: a randomized trial. Ann Intern Med. 2012 Jan 3. 156(1 Pt 1):1-10. [Medline]. Barnsley L, Lord S, Wallis B, Bogduk N. False-positive rates of cervical zygapophysial joint blocks. Clin J Pain. 1993 Jun. 9(2):124-30. [Medline]. Cantu RC, Bailes JE, Wilberger JE Jr. Guidelines for return to contact or collision sport after a cervical spine injury. Clin Sports Med. 1998 Jan. 17(1):137-46. [Medline]. Grob D. Surgery in the degenerative cervical spine. Spine. 1998 Dec 15. 23(24):2674-83. [Medline]. Hohl M, Baker HR. The atlanto-axial joint. Roentgenographic and anatomical study of normal and abnormal motion. J Bone Joint Surg Am. 1964 Dec. 46:1739-52. [Medline]. [Full Text]. Lord SM, Barnsley L, Wallis BJ, Bogduk N. Chronic cervical zygapophysial joint pain after whiplash. A placebo-controlled prevalence study. Spine. 1996 Aug 1. 21(15):1737-44; discussion 1744-5. [Medline]. Manchikanti L, Manchikanti KN, Pampati V, Brandon DE, Giordano J. The prevalence of facet-joint-related chronic neck pain in postsurgical and nonpostsurgical patients: a comparative evaluation. Pain Pract. 2008 Mar. 8(1):5-10. [Medline]. McGrory BJ, Klassen RA, Chao EY, Staeheli JW, Weaver AL. Acute fractures and dislocations of the cervical spine in children and adolescents. J Bone Joint Surg Am. 1993 Jul. 75(7):988-95. [Medline]. [Full Text]. Sherman AL, Young JL. Musculoskeletal rehabilitation and sports medicine. 1. Head and spine injuries. Arch Phys Med Rehabil. 1999 May. 80(5 suppl 1):S40-9. [Medline]. Weinstein SM. Assessment and rehabilitation of the athlete with a "stinger". A model for the management of noncatastrophic athletic cervical spine injury. Clin Sports Med. 1998 Jan. 17(1):127-35. [Medline].